That’s Sam in the background, with “Boo” on his ghost costume. We made a ghost for Lily too, but she didn’t like it. 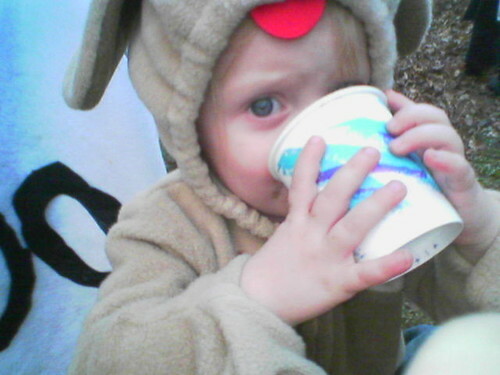 So I produced Sam’s old dog costume and said, cautiously “Lily be doggie?” “No Mommy.” “Cute doggie, Lily. Look at his ears! Look at his tongue!” There was a moment of consideration, then she sat down in my lap and stuck her legs out for the fitting. As I remember it, with Sam, I just stuck it on him. He took little or no interest in the matter. And everytime someone gave him candy in his pumpkin bucket, he solemnly reached in, took it out and gave it back to them. Lily accepted candy with glee. Then she went home, opened it all up, put each thing in her mouth, spit it out and that was the end of it. Sam would rather give candy to trick or treaters than trick or treat himself, won’t take more than one piece out of anyone’s bowl, gave away everything he hadn’t tried before and liked and has now, as far as I can see, forgotten he has any candy at all.